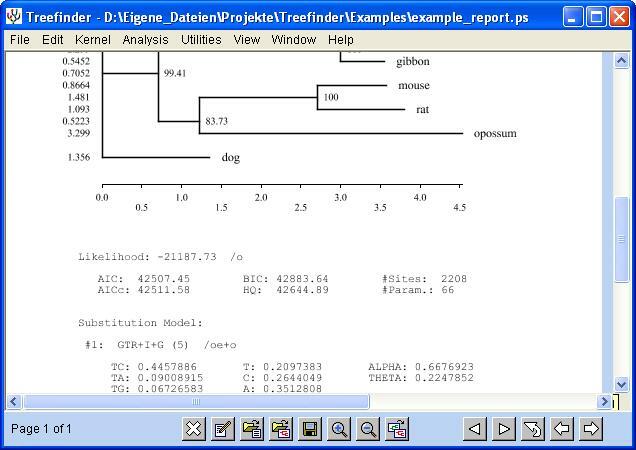 TREEFINDER computes phylogenetic trees from molecular sequences. Starting from 1st October 2015, I do no longer permit the usage of my TREEFINDER software in the following EU countries: Germany, Austria, France, Netherlands, Belgium, Great Britain, Sweden, Denmark - the countries that together host most of the non-european immigrants. For all other countries, the old license agreement remains valid. USA has already been excluded from using Treefinder in February 2015. This is all in accordance with the license agreement stated in the TREEFINDER manual since the earliest versions, which reserves me the right to change the license agreement at any time. I can do this because Treefinder is my own property. The reason: I am no longer willing to support with my work the political system in Europe and Germany, of which the science system is part. There is no genuine democracy, and I disagree with almost all of the policies. In particular, I disagree with immigration policy. Immigration to my country harms me, it harms my family, it harms my people. Whoever invites or welcomes immigrants to Europe and Germany is my enemy. Immigration is the huge corporations' interest, not peoples' interest. I am not against helping refugees, but they would have to be kept strictly separated from us Europeans, for some limited time only until they return home, and not being integrated here as cheap workers and additional consumers. Immigration unnecessarily defers the collapse of capitalism, its final crisis. The earlier the system crashes, the more damage can be avoided. Possibly a civil war in Europe. Not to mention the loss of our European genetic and cultural heritage. The TREEFINDER version of March 2011 together with the above and all previous license changes becomes "the latest version" according to license statement in the manual! Starting from 1st February 2015, I do no longer permit the usage of my TREEFINDER software in the USA. For all other countries, the old license agreement remains valid. This is in accordance with the license agreement stated in the TREEFINDER manual since the earliest versions, which reserves me the right to change the license agreement at any time. (1) I want to protest against American imperialism, which I regard as the cause of most of all evil in the world: wars, tyranny, poverty, migration. (2) I want to protest against EU tyranny, which is mostly the result of US imperialism. (3) I want to demonstrate my sovereignty, something I would welcome to see much more often in science and politics. In particular, I dislike that the USA and the EU aggressively promote a way of life that conflicts with my own way of life. I dislike the flood of immigrants they caused to come here - come here to replace unprofitable Europeans like me. After so many years of hard work on TREEFINDER, I have still not been paid any reward. I want to stress that this license change is not against my colleagues in the USA, but against a small rich elite there that misuses the country's power to rule the world. The USA is our worst enemy. more protein models: FLU, mtZOA, EX.., EHO.., EXEHO..